Bremerton, Washington children’s book illustrator and artist Toni Yuly returns today with another wonderful book for the youngest booklovers (and those who love them). 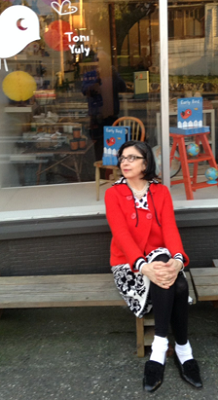 A former librarian, she is the author/illustrator of 6 children’s books, all of which bring us close to the natural world. 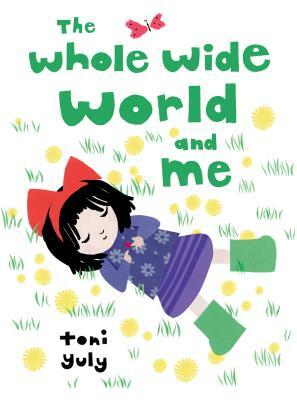 Her books, Thank You, Bees; The Jelly Bean Tree; Cat Nap; Night Owl; and Early Bird are much loved here, and we’re glad to welcome her to celebrate the publication of The Whole Wide World and Me (Candlewick). “Eye-catching, perspective-shifting illustrations pair beautifully with simple text to embrace a child's world...Bold colors frame but do not overtake the gentle story, and the composition of each spread deserves close attention--Yuly carefully balances white space and color and zooms out from macro focus to wide angle to demonstrate scale and perspective. A story that ends as it begins--colorful, peaceful, and just right for the very youngest naturalists. --Kirkus Reviews . Children and adults are both encouraged to attend today.